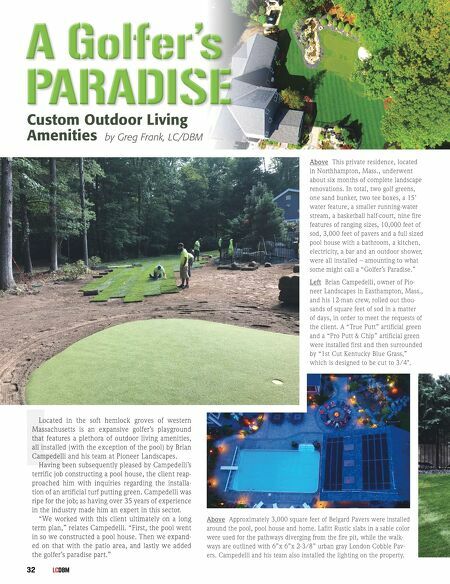 June 2018 33 Right Installation of this 15' water feature and the fire pit were difficult because the main gas and sewer lines for the house go right underneath them. 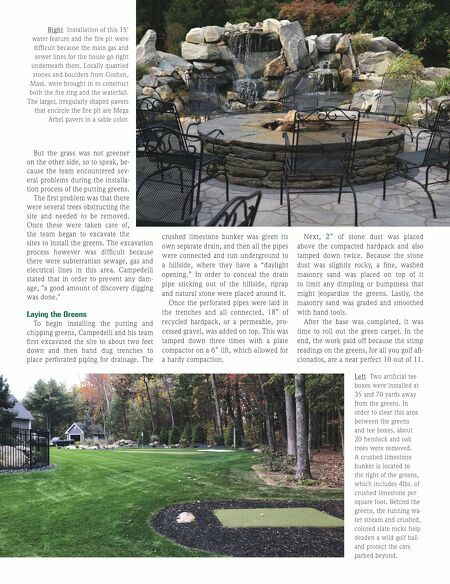 Locally quarried stones and boulders from Goshen, Mass. were brought in to construct both the fire ring and the waterfall. The larger, irregularly shaped pavers that encircle the fire pit are Mega Arbel pavers in a sable color. Left Two artificial tee boxes were installed at 35 and 70 yards away from the greens. In order to clear this area between the greens and tee boxes, about 20 hemlock and oak trees were removed. A crushed limestone bunker is located to the right of the greens, which includes 4lbs. of crushed limestone per square foot. Behind the greens, the running wa- ter stream and crushed, colored slate rocks help deaden a wild golf ball and protect the cars parked beyond. But the grass was not greener on the other side, so to speak, be - cause the team encountered sev- eral problems during the installa- tion process of the putting greens. The first problem was that there were several trees obstructing the site and needed to be removed. Once these were taken care of, the team began to excavate the sites to install the greens. The excavation process however was difficult because there were subterranian sewage, gas and electrical lines in this area. Campedelli stated that in order to prevent any dam - age, "a good amount of discovery digging was done." Laying the Greens To begin installing the putting and chipping greens, Campedelli and his team first excavated the site to about two feet down and then hand dug trenches to place perforated piping for drainage. The crushed limestone bunker was given its own separate drain, and then all the pipes were connected and run underground to a hillside, where they have a "daylight opening." In order to conceal the drain pipe sticking out of the hillside, riprap and natural stone were placed around it. Once the perforated pipes were laid in the trenches and all connected, 18" of recycled hardpack, or a permeable, pro - cessed gravel, was added on top. This was tamped down three times with a plate compactor on a 6" lift, which allowed for a hardy compaction. Next, 2" of stone dust was placed above the compacted hardpack and also tamped down twice. Because the stone dust was slightly rocky, a fine, washed masonry sand was placed on top of it to limit any dimpling or bumpiness that might jeopardize the greens. Lastly, the masonry sand was graded and smoothed with hand tools. After the base was completed, it was time to roll out the green carpet. In the end, the work paid off because the stimp readings on the greens, for all you golf afi - cionados, are a near perfect 10 out of 11.